Santa Rosa Junior College offers English as a Second Language classes in several locations. Many are credit classes while others are non-credit classes. You can visit the ESL department home page for information on how to get started and much more. Petaluma Adult School ofrece varias clases gratuitas para el estudiante de inglés. Nuestro programa incluye inglés como segundo idioma, nivel 1 hasta nivel 4; preparación para la ciudadanía; y habilidades de computación básica de ESL. Clases diurnas y nocturnas están disponibles en Petaluma, ​​ incluyen guardería gratuita y estacionamiento gratis. Petaluma Adult School también ofrece un programa de Diploma de prepatoria/educación media y equivalencia tanto en inglés como en español. Las clases están disponibles en Petaluma, Santa Rosa y Sonoma. 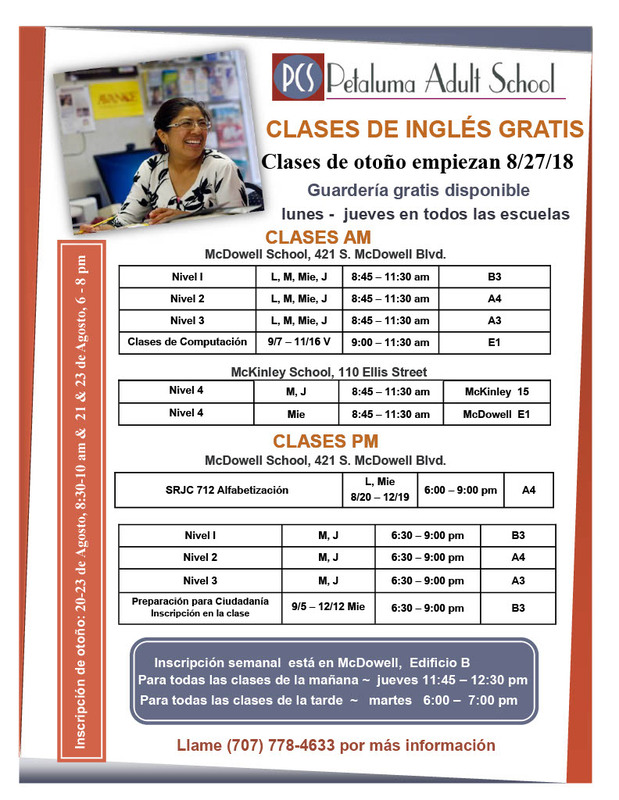 Petaluma Adult School offers a number of free classes for the English language learner. Our program includes English as a Second Language, level 1 through level 4; Citizenship Preparation; and ESL Basic Computer Skills. Day and evening classes are available in Petaluma, and also include free child care and free parking. Petaluma Adult School also offers a High School Diploma program in both English and Spanish. High School Diploma, and Equivalency, classes are available in Petaluma, Santa Rosa, and Sonoma. Petaluma Adult School is dedicated to lifelong learning, from cradle to career and beyond. Our educational options range from parenting and early learning programs for families with young children to those with school-age youngsters. We also provide support for completers of a high school diploma or GED, introductory computer skills training, and Citizenship Preparation, English language development, along with several medical career and apprenticeship training programs. Las clases de ESL de otoño comienzan el lunes 28 de agosto y continúan hasta el 14 de diciembre de 2018. Hay guardería y estacionamiento gratuitos disponibles. Niveles 1-4. Cuidado de niños gratis está disponible. Nota: No hay cuidado infantil disponible para esta clase. Niveles 1-3. Cuidado de niños gratis está disponible. 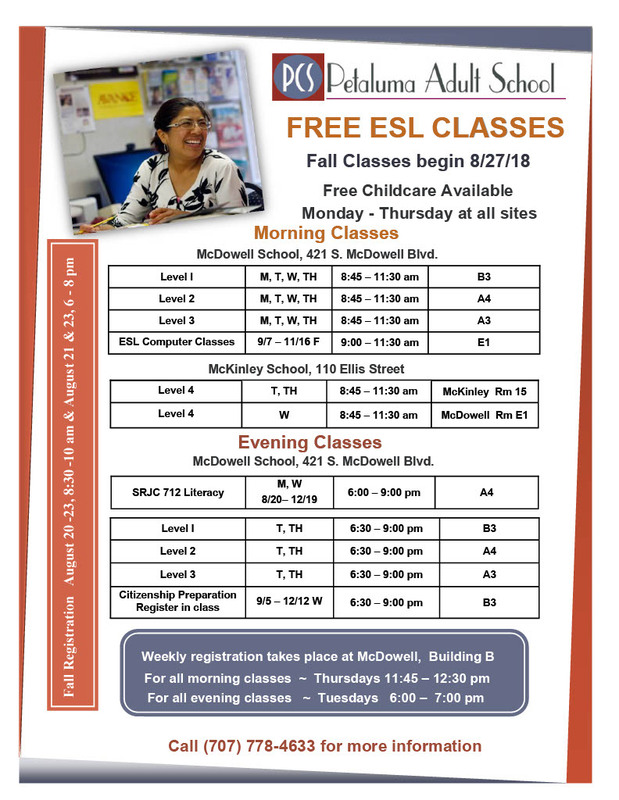 Mié, 6:30 – 9:00 p.m.
Fall ESL CLASSES begin Monday, August 28th and are on-going through December 14, 2018. Free child care and parking available. Levels 1-4. Free childcare is available. Note: No child care is available for this class. Levels 1-3. Free childcare is available. 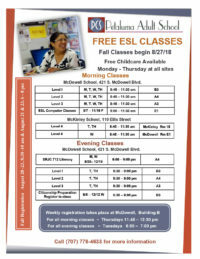 Roseland English for Adult Learners has been offering Free structured English as Second Language (ESL) classes to the community since 2008. Our year round program offers three levels of English Instruction. Our ESL classes are taught by 6 volunteer TESOL certified teachers dedicated to teach our students. Interested students come to classroom 34 on Tuesdays or Thursdays between 6:30-8:30pm and speak with Ellen or David Bailey. Classes are Free. Students are asked to purchase their own books. Offers child care for all the activities and classes for children aged 2- 5 years old. This semester, Vía Esperanza Centro de Educación looks to offer the great classes and programs that our community knows and loves, with the addition of a few new opportunities to learn, grow, and flourish! Read on to learn more about what we offer and how you can sign up! 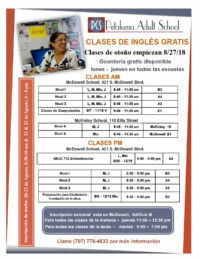 All classes and programs at Vía Esperanza are FREE. Child care is provided at no cost for most classes and activities. For more information and to enroll, please visit our office in person Monday through Friday from 8:30 AM – 5:00 PM or give us a call at (707) 480-9374 or (707) 867-7290.